I know a lot of you guys visit my blog (and I most humbly thank you....seriously) for tips, information, and product reviews. I put a lot of my time into making the information that I read, research, and come across widely available and accessible to you all. I double and triple fact-check things before I share them, because I want to make sure that you and I are getting the best and most accurate information available. But you know how sometimes you dole out advice, and don't take it yourself? Yeah, that's been me for the past few weeks. A part of me wants to make excuses, and offer up a few reasons for why. But deep down inside, I know there's not a single good enough explanation. Except for the fact that I'm human and prone to err. I wasn't naive enough to believe that I could get real color (not that ammonia-free Garnier stuff) and just treat my hair however. But I did think that I could make minimal (and I mean minimal) tweaks to my regimen and be just fine. This article by Kala G (The KG Lifestyle) cosigned on my thoughts exactly. I was already washing my hair twice a week, deep conditioning weekly, and moisturizing regularly. I figured I would just incorporate a heavier moisturizer, do more cowashing, and keep it moving. But as I eventually discovered, that wasn't enough. Now, don't misunderstand me. I love me some Kala G, she's my blogger BFF and mentor in my head. If it wasn't for her laying the foundation, my transition from heat damage wouldn't have been as successful as it was. But the regimen tweaks that worked so well for her were not giving me any sort of life whatsoever. My ends remained rough-feeling and dry (my color is on my ends), and were tangling like crazy. To make matters worse, it seemed like every time I touched my hair I ended up with wisps of breakage in my hand. I felt like my hair had gotten weaker and wasn't responding to the teensy weensy changes I had made in my regimen. I started rummaging through my mental Rolodex of solutions. I hadn't henna'd in a while, so I tried that. No luck. I upped the number of times in a day I moisturized my hair, and just ended up with sticky, frizzy hair. I increased the amount of protein-ish conditioners I used. No luck there, either. Finally, it dawned on me after poking around the internets (and reading old articles from like 2011 by Jc of The Natural Haven). Christina, when was the last time you did a real, live protein treatment? I didn't even need to answer myself -- I knew it had been entirely too long. My first and last protein treatment came early in my transition, when I did the ApHogee 2-Step Protein Treatment. The smell was so horrible, and the process was so freakishly precarious that I swore to never do it again. But I knew a protein treatment was something I seriously needed to consider if I wanted to get my healthy colored hair back on track. I decided to baby-step my way in to protein, and picked up the ApHogee 2-Minute Reconstructor. My prayer was that it would work well enough for me to avoid the dreaded 2-Step Treatment. To make a long story short (and save more for my final review), it's working out well for my hair in conjunction with all my other changes. I'm layering in products like I know I should, using more potent moisturizers, cowashing more (hey Tresemme Naturals! ), and sealing my ends. I'll report back soon with more updates on restoring the health of my hair after dye. The Fix: Colored hair requires different care, period. Don't be lazy about it, or wait until it's too late to start investing in the health of your hair. Cuticles have to be lifted (and are sometimes damaged in the process) in order to lift and deposit color. Therefore, using products with heavy-duty hydrating and moisture-retaining properties are key, as is maintaining a protein balance. I'm layering products in the LCO order, with an emphasis on more potent leave-ins and moisturizers. Restructurizing protein treatments and sprays to fill in and strengthen cracks and chips in the cuticle are a must. To get my hair back on track, I'm backing away from twice a week wash and go's for now, and using ApHogee's 2-Minute Reconstructor every week before deep conditioning. One of my quasi-successful attempts at big day 1 hair. To add insult to injury (and breakage too), I found myself lost in the social media sauce. The internets have been going absolutely nuts over big hair, and I found myself craaaaaving that Instagram-cropped-my-curls-tho look. Normally, my hair would get somewhere in the ballpark around day 3 or 4, and sometimes 5 depending upon the products I used. But I got impatient. I wanted big hair on day 1. So I did all kinds of ridiculously out of character things. I diffused my hair to hell and back. If I didn't like the way my hair was setting with a particular curl definer, I'd wash it out and start over. I know this is asinine, I can't believe I'm even telling ya'll this. I experimented with an afro pick, my Q-Redew, and even used the prongs of my diffuser to separate curls and fluff. Then about a week ago (week ago! lol), I realized that what I was doing made no sense. Not only was I competing to play in the big hair olympics of Instagram, I was sacrificing the health of my hair because of it. So I stopped playing, and now my hair is rehabbing in chunky twists. The Fix: Step away from deficit thinking. Focus more on what your hair is and can do, instead of what it isn't and can't. Easier said than done, and I'll be the first to admit it. I'm still learning to appreciate the beauty in others without feeling the need to "be like that" myself. I'll probably do a social media detox soon. After my dalliance with the Max Hydration Method, I was at an impasse. Should I continue the MHM, or certain portions of it? Should I go back to shampoo or just cowash? Am I gonna use cones or nah? Believe it or not, I did all of the above and then some. And slowly but surely, I began turning my back on the time-tested things I knew worked for my hair. I let henna (which has done wonders for my hair and scalp) take a back seat to clay masks (mistake). I neglected holy grail status deep conditioners, leave-ins, and moisturizers because they contained cones (like I gave a hoot before MHM). And perhaps the most egregious offense, I gave in to this trend of doing the least when it comes to caring for our hair. I started cutting corners, and cutting out products altogether (my LCO became a LCD -- just leave-in and curl definer...no moisturizer, no oil). Some days, I wouldn't even bother trying to moisturize my hair before bed. And I'll be the first to tell you that my hair suffered for it. The worst part about this mistake is that I knew better. I say it all the time -- do what works best for you and your hair. And here I was, being about as impressionable as they come. I need a whoopin'. The Fix: Nobody knows your hair like you do. I was silly to fall in with all the silcone fear-mongering and the lazy natural crowd. I know almost too much about silicones to be afraid of them. I said it before, and I'll say it again -- nobody knows your hair like you. If Vaseline gives you the bomb twist-out, don't let anybody tell you that you shouldn't do it. 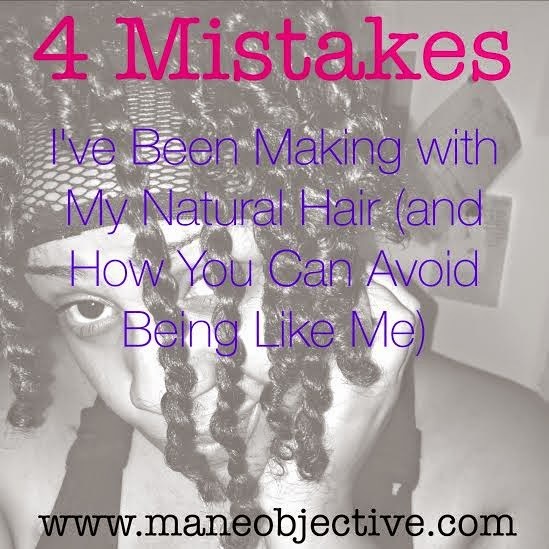 Don't be a victim of the natural hair fear-mongering campaigns. With that being said, you're back on Eva NYC Therapy Session Hair Mask! Have you ever been in a relationship where you or your partner got kind of complacent, and stopped doing the little things that made you smile, feel special, and warm your heart? That's pretty much what happened to me and my hair. I stopped oiling my scalp for scalp massages, stopped doing coconut oil pre-poos before detangling, stopped sealing my ends, and stopped attempting to make my wash and go's as low manipulation as possible. In the lazy vein of #3, I stopped doing all of the things that afforded me a successful transition and months of completely natural growth. I figured I could do the least, and just put some 'tussin on it (aka deep conditioner) twice a week and be fine. No. No. NO. 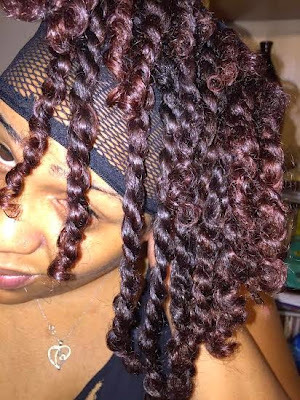 Contrary to popular belief, deep conditioning is not going to solve all of your problems. Will it help, yes. Is it going to allow you to get slipshod in all other aspects of caring for your hair? Take it from me, the answer is no. The Fix: Back to basics. Back to doing all of the things that caused your hair to thrive. For me, that means regular scalp massages, coconut oil pre-poos, more cowashing (and then using shampoo like once a month), my ApHogee treatment weekly, deep conditioning with time-tested products, layering things the right way in my hair, being patient and let it get big on it's own (hey day 3 hair), sealing my ends, monthly henna treatments, caring for my edges, and occasional protective styling. Your hair may not require all of these things, but each component of this plan lent itself to the success of my hair journey. Think long and hard about what your hair responds best to, and do those things. Well guys, I've bared my natural hair soul. Am I the only one that fell off and had to get back on board? Share your stories below! Let's support each other -- no one is perfect! I've learned a lot from your mishaps. Some of them were wins for me!! Thanks for your help. I'm glad you found your path again! Thank you for sharing! I have really started listening to my hair and seeing how it responds to products. I have realized the coveted Shea Moisture Curl Enhancing Smoothie is just too heavy for my hair and my scalp gets too oily by Day 2-3. 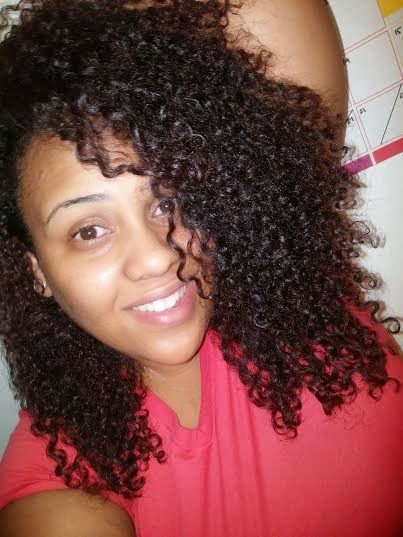 Lightweight products are what is working best for me and sometimes just Mixed Chicks Leave-In Conditioner is enough to moisturize and style! Since so many natural hair bloggers/Youtubers use a grip of products, I felt I was doing something wrong with only using a few. We need to look to others for ideas, not for the full regimen. That's the beauty of natural hair - it's all different! I totally agree!!!! And Curl Enhancing Smoothie is way too heavy, no matter how little I use. And the Mixed Chicks failed me too, lol. It really is about capturing the essence and doing what works best for your hair! By the way, it was nice meeting you at Afrolicious!!! 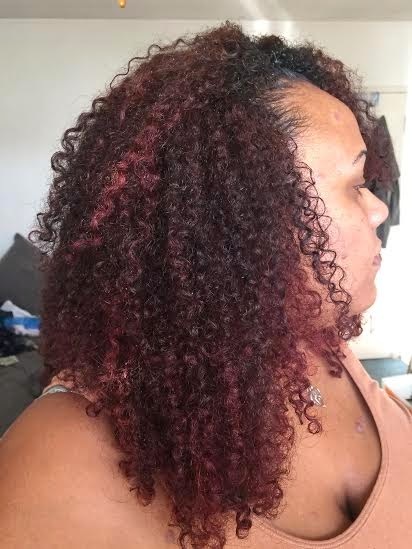 I realized the Shea Moisture Curl Enhancing Smoothie, just does not work with my hair. My latest use produce a lot of flakes and build-up which my hair does not do. Didn't have much left so I threw it away. Hey Christiana, just discovered your blog through Happily Ever After. I've enjoyed reading your articles. Thank you so much for sharing.